You ask yourself what trading is, how it works and what returns are possible? Would you like to have a gentle introduction to trading? This course is perfect for beginners, because we clarify all important basics of trading. 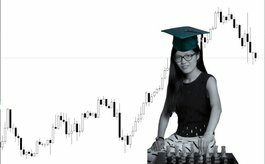 This course was designed especially for Women's World Chess Champion Hou Yifan and helped her make her first trade and prepare her for our group investment challenge where our goal is to generate €100,000 in profits together with all participants. Learn to use a strategy that allows you to get to know the markets in practice, i.e. enter the market with real money, limited risk and the chance for a good return, while being optimised for learning. This means that the strategy starts simple and can be expanded and modified later on as you learn more. Is it possible to beat the market? Part II of this course will help you modify our beginner strategy or develop your own strategy as well as teach you how to invest on different time-horizons.